High fructose corn syrup (HFCS) is a sweetener made from corn. It’s safe, has the same number of calories per serving as table sugar (4 calories per gram) and is recognized the same way by your body once digested. I read that HFCS is not the same as sugar and causes obesity. Is this true? Neither HFCS in beverages, nor any other single food, beverage or ingredient alone is responsible for obesity. HFCS and sugar have nearly the same proportion of fructose and glucose, which makes their sweetness nearly identical. Because their composition is nearly the same, your body recognizes them the same way once digested. The American Medical Association has stated that HFCS is no more likely to contribute to obesity than table sugar or other full-calorie sweeteners. Aspartame is a low-calorie sweetener used in more than 6,000 foods and beverages around the world. It is one of the most thoroughly researched and studied food ingredients in use today with more than 200 studies supporting its safety. Only people born with PKU (phenylketonuria), a rare disorder, need to avoid phenylalanine, one of the components of aspartame, because their bodies cannot break it down. But the fact that a very small percentage of the population has this rare genetic condition does not mean in any way that aspartame is unsafe for other people. No. More than 200 studies have confirmed the safety of aspartame. The results of these studies have shown that aspartame does not cause cancer. All the ingredients we use are safe – we have an uncompromising commitment to product safety. Stevia is a plant in the chrysanthemum family native to Paraguay. Its leaf is a unique source of intense, natural sweetness. Sweeteners made from stevia are safe, come from natural origins and have zero calories. In North America, we offer a number of beverages sweetened with stevia in combination with other natural sweeteners like fruit juice, sugar and other low- and no-calorie sweeteners. Are the ingredients in your energy drinks safe? Yes. All of the ingredients in our energy drinks are safe and comply with all regulatory requirements. We also label all of our energy drinks with total caffeine amounts and advice about caffeine consumption. Yes. Both Health Canada and the U.S. Food and Drug Administration (FDA) have found caffeine levels up to 400 mg per day to be safe for healthy adults. But some people may be sensitive to caffeine. Pregnant or nursing women, women trying to become pregnant, and people with medical conditions sensitive to caffeine should always consult their health care provider about foods and beverages with caffeine. If you are looking for caffeine-free beverages, we offer a variety of options to choose from. Caffeine does not meet the criteria for addiction (dependence). Studies show that people are able to reduce or stop drinking coffee and other caffeinated drinks without serious psychological or physical problems. No. According to the US Institute of Medicine, all beverages hydrate, including those with caffeine. Are soft drinks bad for your teeth? Poor dental hygiene is the main cause of tooth decay and enamel erosion. Any food or beverage containing sugars and starches can contribute to tooth decay, and acidic foods and beverages can contribute to enamel erosion. Soft drinks are no exception. But that’s only if you don’t take care of your teeth. Make sure you brush your teeth, see your dentist regularly and follow his/her advice. Does Coca-Cola contain cocaine? Did Coke contain cocaine in the past? No. Coca-Cola does not contain cocaine. Cocaine has never been added to Coca-Cola. Coca-Cola is a non-alcoholic beverage – alcohol is not added as an ingredient. However, because trace levels of alcohol are unavoidable in many natural food products and ingredients – e.g., bananas, yogurt, bread, grapefruit – trace levels of alcohol may be found in Coca-Cola and some of our other beverages. Governments and religious organizations recognize that trace levels of alcohol, which exist as a result of natural processes, are completely normal and acceptable in non-alcoholic foods and beverages. What is BPA? Is it in your packaging? Bisphenol A (BPA) is a chemical found in the lining of aluminum cans. A very small amount of BPA can be found in our aluminum beverage cans. Regulatory agencies in the U.S. and many other countries have repeatedly stated that the BPA levels in food and beverage packaging are safe. Of course, we also sell products in PET plastic and glass, which don’t contain BPA. All of our products, regardless of the type of packaging used, are safe. Is the caramel coloring in Coca-Cola beverages safe? Yes. The caramel coloring used in our products has been evaluated for safety by agencies like the Joint Expert Committee on Food Additives of the World Health Organization and the United States Food & Drug Administration. All of the ingredients we use are safe – we have an uncompromising commitment to product safety. Some people claim that sugar is toxic. Is this true? No. Sugar is safe and has been enjoyed since the beginning of time. But all foods and beverages, including those that contain sugar, should be consumed in moderation as part of a balanced diet combined with regular physical activity. The amount of sugar you consume should fit within your overall nutrient and calorie needs. Can I become addicted to sugar? Do beverages with low- and no-calorie sweeteners make you hungrier? No. Low-and no-calorie sweetened beverages will not increase your appetite or lead to weight gain. Studies show that after drinking beverages sweetened with low- and no-calorie sweeteners, a person has the same hunger reaction as they do after drinking water. Research has shown that foods and beverages containing low- and no-calorie sweeteners can help people manage their calorie intake and, if used consistently to reduce calories, can help manage weight. No. Low and no-calorie sweeteners do not cause cancer. They have been safely enjoyed by people all over the world for more than a century. The U.S. National Cancer Institute has concluded that low- and no-calorie sweeteners are not related to cancer risk in humans, and the Academy of Nutrition and Dietetics says you can safely enjoy a range of both full-calorie sweeteners and low- or no-calorie sweeteners as part of a sensible diet. Do soft drinks weaken your bones? No, soft drinks do not weaken your bones or cause osteoporosis. The main causes of poor bone health are not taking in enough calcium in your diet, insufficient vitamin D, changes in female hormones and a lack of weight-bearing physical activity. Some people claim weak bones occur because too much phosphoric acid in cola drinks or too much caffeine keeps your body from absorbing calcium. However, experts have reviewed these claims many times and found that there is no negative effect for healthy people who are getting enough calcium. Does the sodium in soft drinks make you retain water? Our soft drinks contain only a small amount of sodium. For healthy people, this is unlikely to lead to any significant retention of water. For example, Coca-Cola contains less than 45 mg of sodium per 12 fluid ounce serving. Most of the sodium comes from the water used to make the beverage. Eating and drinking more calories than you burn can lead to overweight and obesity, which are risk factors for heart disease and stroke. It’s important to keep in mind that all calories count, including those from our caloric beverages and anything else with calories. We offer a wide variety of products for every lifestyle, including more than 180 low- and no-calorie options to help you manage your calories. Does drinking sugar-sweetened beverages cause diabetes? Eating and drinking more calories than you burn can lead to overweight and obesity, which are risk factors for type 2 diabetes. It’s important to keep in mind that all calories count, including those from our caloric beverages. We offer a wide variety of products for every lifestyle, including more than 180 low- and no-calorie options to help you manage your calories. Coca-Cola and other sugar-sweetened beverages have calories – and all calories count in managing your weight. But people consume many different foods and beverages, so no one single food or beverage alone is responsible for people being overweight or obese. All foods and beverages can have a place in a sensible, balanced diet combined with regular physical activity. Do soft drinks help you stay hydrated? Yes, all beverages hydrate. Each of our sparkling beverages, with or without calories or caffeine, contains between 85% and 99% water, which makes them good sources of hydration. When choosing hydration options that fit your lifestyle, it’s important to keep in mind that all calories count, including those from caloric beverages. When it comes to our sugar-sweetened beverages, there are no “empty calories.” Coca-Cola and other sugar-sweetened beverages provide refreshment, enjoyment and hydration. They also provide carbohydrates, which are essential nutrients for life and are a source of energy (calories). With that in mind, it’s important to remember that all calories count—including those from caloric beverages. Brominated vegetable oil (BVO) can be safely used in fruit-flavored beverages at the levels permitted by the U.S. Food and Drug Administration (FDA). We use BVO in a few of our beverages since it improves the stability of our products, preventing some ingredients from separating. While we are confident in the safety of all our beverages, we continuously look for ways to improve our products and take consumers’ concerns into account. The safety and quality of our products are our highest priorities, and we comply with all applicable regulations everywhere we operate. Can I have allergic reactions to food colorings or other ingredients in soft drinks? Although rare, allergies or sensitivities to certain foods or ingredients affect some people. The ingredient statement on product labels helps you avoid these ingredients. True allergies are triggered by proteins. Food sensitivities can be caused by cochineal and tartrazine (food colors) and sulfites (preservatives). Our beverages and the ingredients in them are all safe and meet all allergen labeling requirements. Our ingredient listings include colorings, sulfites and preservatives when used so that you can avoid them if necessary. Do beverages containing sugars and food colors cause hyperactivity in children? No research has shown a credible link between sugar or food colors and hyperactivity in kids. In March 2011, the U.S. Food and Drug Administration convened a safety review panel to review synthetic food colors. The panel overwhelmingly agreed that there’s no such causal link. All of the ingredients used in our products are permitted by health authorities and are safe. Carbonation occurs when we mix water with carbon dioxide (CO2) under pressure to create carbonated water – the primary ingredient in all of our sparkling beverages. This safe, calorie-free ingredient gives our sparkling beverages their unique biting taste and refreshing quality. What is acesulfame potassium (Ace-K or acesulfame K)? Ace-K is a zero-calorie sweetener currently used in foods and beverages around the world. The U.S. Food and Drug Administration and other regulatory authorities worldwide have concluded that Ace-K is safe for use in foods and beverages. Saccharin is a calorie-free sweetener that has been used in foods and beverages for over a century. Saccharin is one of the most widely studied food ingredients and has been confirmed as safe for all populations, including children, people with diabetes and women who are pregnant or nursing. Sucralose is a no-calorie sweetener derived from sugar and is 600 times sweeter than sugar. It has been evaluated in numerous scientific studies demonstrating its safety. These studies were also independently reviewed by experts who all agreed that sucralose is safe for everyone, including pregnant and nursing women and children. Why are some soft drinks sweetened with high fructose corn syrup (HFCS) instead of sugar? HFCS is used as a sweetener in some foods and beverages (including soft drinks) because it tastes sweet like sugar, is easy to use in the food manufacturing process, and in the U.S. historically has cost substantially less than cane or beet sugar. HFCS and sugar have nearly the same proportion of fructose and glucose, which makes their sweetness nearly identical. They have the same amount of calories (4 calories per gram) and are recognized the same way by the body once digested. 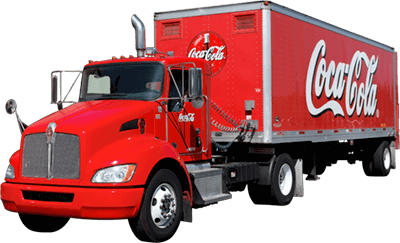 Besides Coca-Cola, what other beverages are offered by The Coca Cola Company? I heard that Coke can be used as a household cleaner and that it’s harmful to drink. Is this true? No, Coca-Cola is not harmful to drink. All of our beverages, including Coca-Cola, are safe. There is a small amount of edible acid present in many foods, including fruit juices, buttermilk and soft drinks like Coca-Cola. These foods are not acidic enough to harm your body tissues – in fact, your own natural stomach acid is stronger. It is possible that the edible acid in any of these products could have cleaning effects, even though it’s still completely safe to drink these products. The rumors about disappearing teeth, nails, steaks and various other objects are just that – rumors. For more information, check out www.snopes.com/cokelore/acid.asp.